Rabbi Werbow hails from Buffalo, New York, from a conservative Jewish household where the discipline, as well as beauty of Judaism, was taught. His parents fostered teenage children from disruptive inner-city homes for periods of two to three years. He has fond memories of this loving environment growing up and the fun weekends of the family going camping and observing Shabbat at campsites. Although Rabbi Werbow initially went to college to study accounting, his work with special needs campers at Camp Ramah in New England began his transition into Jewish professional life. He was active in USY (United Synagogue Youth) in high school and spent his first year of college in Israel with NATIV, an academic leadership program. Rabbi Werbow holds a bachelor's degree in Special Education and a master’s degree in Jewish Education. A position as Youth Director working with teens in Lexington, MA, motivated him to attend the Ziegler School of Rabbinic Studies at the American Jewish University (formerly University of Judaism) in Los Angeles, where he was ordained in May of 2006. He moved to Pittsburgh to serve as Congregation Beth Shalom’s Assistant Rabbi before assuming the position of Rabbi in 2009. Being cognizant of changing needs in the community, one of his endeavors was a collaboration with lay leaders and local professionals to design a joint Jewish Education Program for his Conservative congregation and a neighboring Reform synagogue. Asked how he met his wife Melissa, he smilingly said, "literally, across a crowded room.” He was a student at the rabbinical school in Los Angeles and she was studying for her Master's at Hebrew Union College in Jewish Education and Jewish Communal Service. The Werbows have three children - daughter Maya, 12; son Lev, 8, and Asher, 5. In addition to teaching, preaching, and the standard rabbinic endeavors, Rabbi Werbow is known for his warmth and openness. He is excited to be at the helm of the largest conservative synagogue in this area and is involved with community activities along with his rabbinical duties. The Board of Directors is responsible for the management and administration of the affairs of the Congregation. The Board is comprised of volunteer members of the Congregation who are willing to give their time in order to assure that the Temple fulfills its mission of providing its congregants with a superior religious, educational and cultural experience in a warm and welcoming environment. The Board of Directors is elected by the congregation at its annua l congregational meeting. Working through a variety of committees, the Board plans and organizes various programs and activities and manages the assets and property of the Temple. 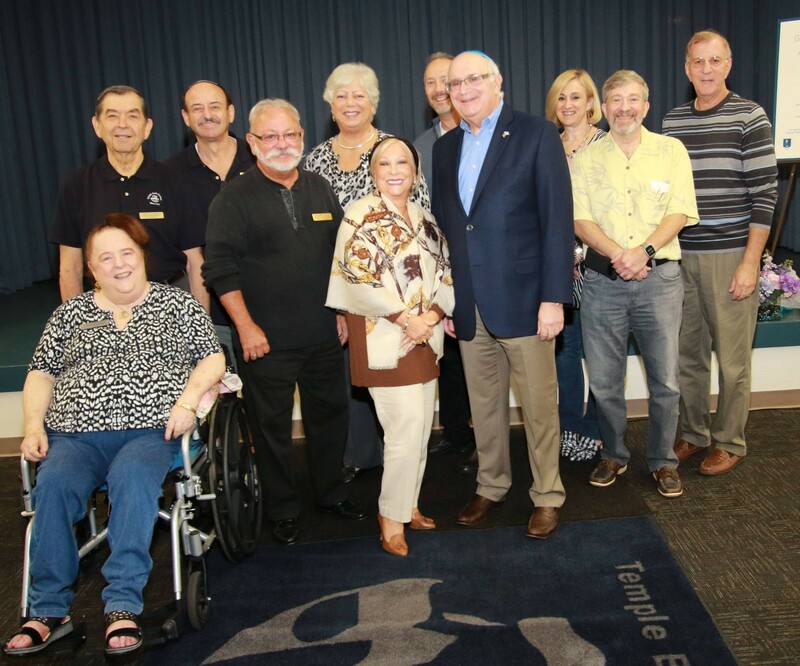 Temple Beth Sholom is fortunate to have superb lay leadership; men and women who are committed to the Temple and work as hard for the Temple as they do at their chosen occupations.